The Soul Talisman is a one-of-a-kind necklace made just for you in my little studio in the Pacific Northwest. The intention behind this offering is that it will become your companion as the gemstones chosen just for you support what you most need. While I create your necklace, I will be holding you in my heart and blessing your stones and your stories. Your necklace will be infused with love and light and will be cleansed with sage before it is packaged up and sent to you. 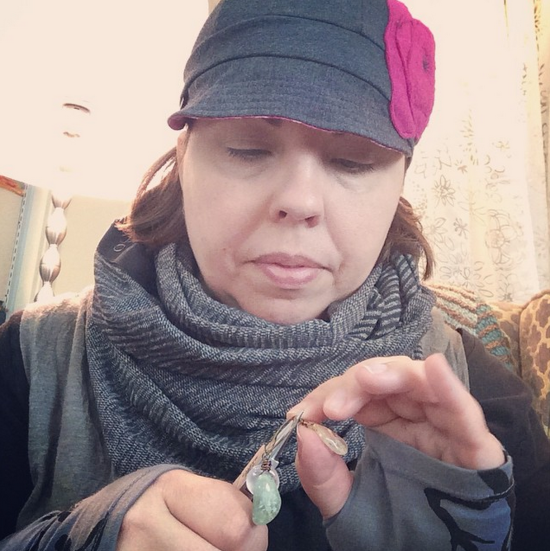 I think of each necklace as deep soul work that I create the foundation for here in my corner as I gather and wire wrap and sing in my studio, and then I send it off to you as a reminder to begin tending to the seeds of that soul work in your corner. Here's how it will work. You answer a few questions about where you are on your path right now along with a couple of style questions. I was amazed that you could know me so well having only the few questions/answers. It was wonderful to know the meaning behind why you chose those specific components for me and my necklace and showed exactly how much care and intention goes into your work. I light a candle in my studio and read your words. Then I sit in the quiet thinking about what you've shared and gather the stones that will support you. Your chosen stones then sit on my altar overnight soaking up the blessings and wisdom that space holds. I set aside another block of time just for you where I bless the stones in light and love and then hand wire wrap them and create your special necklace. Then I handwrite a letter that shares the story behind your necklace, why the gemstones were chosen and other good things. 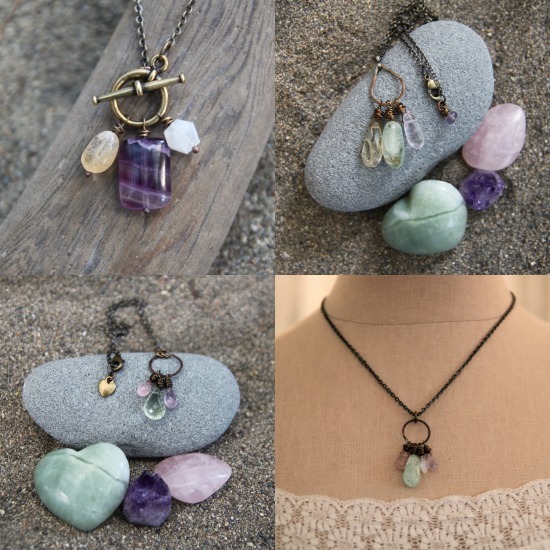 I cleanse your necklace with sage and choose an additional larger gemstone to include in your package that you can sit on your altar or carry with you in your pocket. Then I gather it all together, along with a few other surprises, and send it off with love to you. 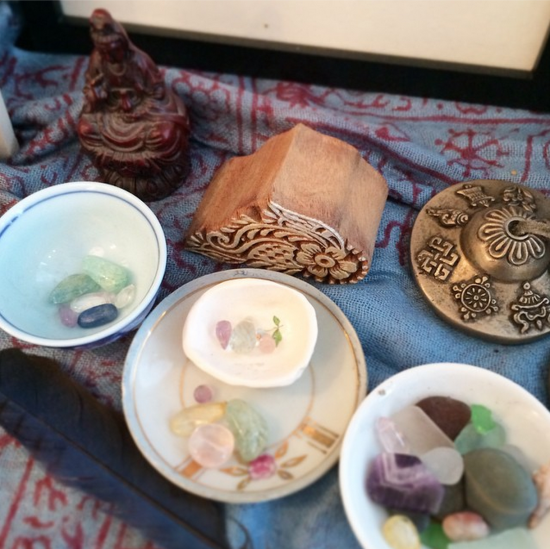 Please note: I will be choosing these gemstones for you from my collection in my studio. They will be stones that connect to what you've shared with me in our email exchange. I will also ask you a few style questions (such as length) but this offering invites you to trust what I'll create for you. "The packaging and care that went into it was great. 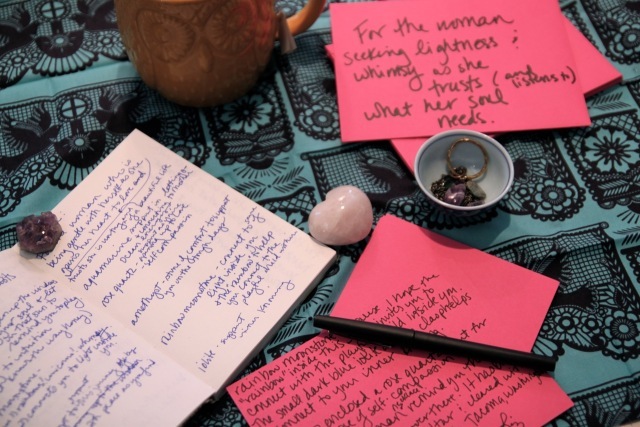 The handwritten note explaining the process and the stones chosen has already been read and reread several times. Love love love it! The amethyst and the note have been added to the alter I keep right in my closet so I see them at the start and end of each day." Sizes: There are two sizes to choose from with this offering: Small and Medium. The smaller necklaces will have daintier gemstones and the entire pendant will be smaller in size. The smaller necklace is $115. Here are some examples. The medium necklaces will be larger with slightly larger gemstones that create a larger pendant. The medium necklace is $135. Here are some examples. To start the process, please choose which size you'd like and pay via PayPal below. The prices include US shipping. International customers, please choose international shipping, which is an additional $7. SPECIAL HOLIDAY PRICE: As a gift from me to you, the price below reflects a 15% off holiday special. This price will be available through December 5. If you'd like to receive your talisman before Christmas, please order by December 5. Orders placed after the 5th will begin shipping out around December 31. After I receive your order confirmation, I'll email you a questionnaire (at your PayPal email address) so we can get started. (If you want me to send it to a different email address, please email me and let me know.) Because of the special time set aside with this offering, your custom necklace will take 1-3 weeks to create.